Being sold with no ongoing chain, this spacious three bedroom mid row residence has a real welcoming feel throughout and would without doubt make someone a great starter home or even a hassle free buy to let investment (£595 pcm income). Benefiting from uPVC double glazing, gas central heating system and insulation to both the front and back; this property would be a perfect purchase for a family. Set in a convenient area near to the amenities in both Poulton and Liscard including Central Park, Tesco Express and frequent public bus links. Well placed for popular local schooling and also only a short drive to the M53 motorway, Birkenhead Docks and Kingsway Liverpool tunnel. Interior: spacious hallway, living room, dining room and L shaped kitchen on the ground floor. Up the turned staircase to the first floor landing there are the three bedrooms and a tastefully refitted modern bathroom. Please see personal interest decleration at end of advert. LIVING ROOM 14′ 04″ x 12′ 01″ (4.37m x 3.68m) uPVC double glazed bay window to front elevation with fitted blinds. Picture rail, central heating radiator and television wall point. Floating modern electric fire. DINING ROOM 11′ 09″ x 11′ 10″ (3.58m x 3.61m) Great for family meal times and for when entertaining. Picture rail, central heating radiator and television point. Electric coal effect fire within a timber surround. KITCHEN 12′ 08″ x 9′ 0″ (3.86m x 2.74m) L shaped kitchen with two uPVC double glazed windows and uPVC double glazed door out to the rear. Matching range of base and wall units with contrasting work surfaces and tiled splash backs. Sink and drainer with mixer tap over. Cooker point. Space and plumbing for washing machine and dishwasher. Oak laminate flooring. 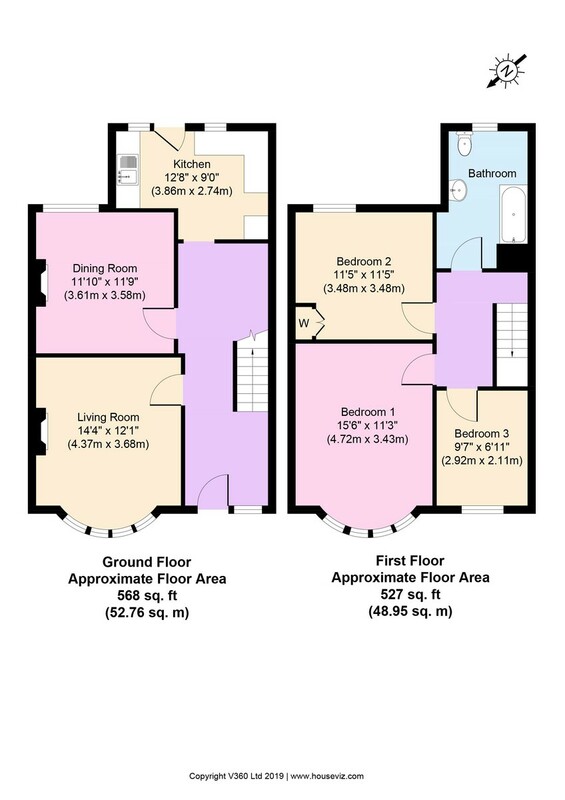 BEDROOM ONE 15′ 06″ x 11′ 03″ (4.72m x 3.43m) uPVC double glazed bay window to front elevation with fitted blinds. Picture rail, central heating radiator and television point. BEDROOM TWO 11′ 05″ x 11′ 05″ (3.48m x 3.48m) uPVC double glazed window to rear elevation with blinds. Picture rail, central heating radiator and fitted storage cupboard in alcove, plus wall mounted combi boiler. BEDROOM THREE 9′ 07″ x 6′ 11″ (2.92m x 2.11m) uPVC double glazed window to front elevation with fitted blinds. Picture rail and central heating radiator. BATHROOM Modern and tastefully refitted bathroom. Suite comprising shaped bath with shower and screen, low level WC and pedestal wash basin with mirror above. uPVC double glazed frosted window to rear elevation. Ladder style radiator, extractor fan and fully tiled walls with tiled flooring. REAR EXTERIOR Courtyard garden with handy outhouse, water tap and timber gate; a superb place to spend time in over the more sunnier months. LOCATION Lumley Road can be found off Liscard Road, approx. 1.1 miles driving distance from our Liscard office. NB In accordance with Section 21 of the Estate Agent Act 1979, we declare that there is a personal interest in the sale of this property. The property is being sold by a relation/member within Harper & Woods Estate Agents.